Family friendly Siesta Park is an absolute beachfront resort, conveniently located between Busselton and Dunsborough, perfect for families of up to 7. 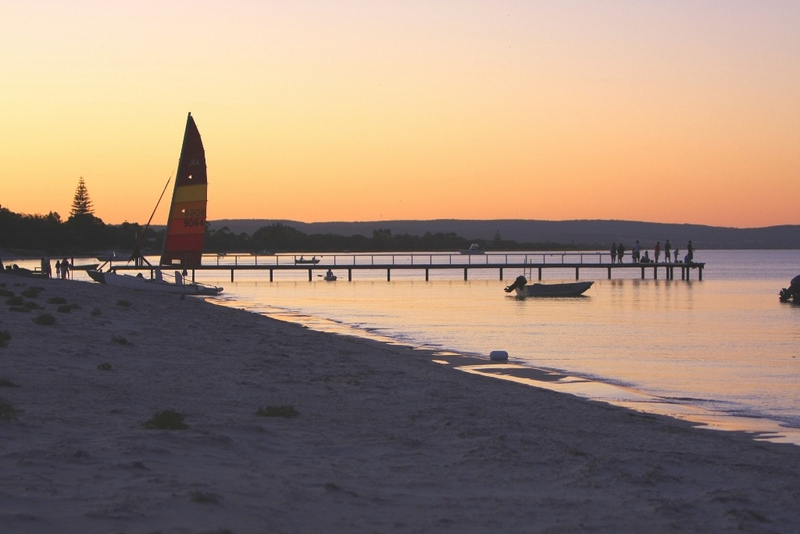 Set along 400 metres of beautiful Geographe Bay, Siesta is a relaxed, family-run park with plenty to offer. Our unique adventure play equipment offers something different for your children to enjoy. From a flying fox to the Tarzan swing, rope bridges and tyre swings, it is fun for children of all ages. At Siesta, we encourage an outdoor lifestyle - we have plenty of lawns and shady peppermint trees, plus our own private resort jetty for fishing and swimming. The bay is generally calm, and we have our own boat ramp for guests to use. There are no roads to cross to get to the beach, and bikes and scooters are welcome. For those wanting a longer ride, there is a cycleway to Busselton and Dunsborough. Our hire row boats are another great feature, plus there's free tennis courts and table tennis. Siesta is nature tourism certified through Eco Tourism Australia, which reflects the feel of the park. Try possum spotting at night, or just relax among the spacious parklands. There is a shop/cafe at the entrance to the park. Siesta has a mix of self-contained accommodation within 50-120 metres of the beach, ranging from 2 & 3 bedroom villas to the more basic 1 & 2 bedroom chalets. Feel free to call us or check out our website to find the most suitable unit for your family. All our units have been designed for a stress-free family holiday with easy care facilities ideal for a beachside break. They all have LCD TV's, full size fridges, fans, heaters, hotplates and microwaves, and some villas are equipped with ovens and washing machines. A communal laundry with dryer is also provided. Located only 12km from Busselton and Dunsborough - and a 30 minute drive to Margaret River township - Siesta is perfectly located to all the attractions the Margaret River Wine Region area has to offer. We invite you to come and see for yourself what life is like at Siesta. Family Friendly Accommodation likes: An eco and family friendly holiday experience where children can play on a flying fox or swim in the calm waters of this beachfront property.